NB, none of these shades are limited edition and can still all be bought today! I reviewed Estee Lauder Candy here and said I hated it-but guess what-it's really grown on me!! Also I love the sleek gold packaging. I love the colour of the Illamasqua lipstick in Drench but I hate the formula! It's very drying and I couldn't get it to go on evenly at all. I think this may be relegated to the back of the drawer for some time. 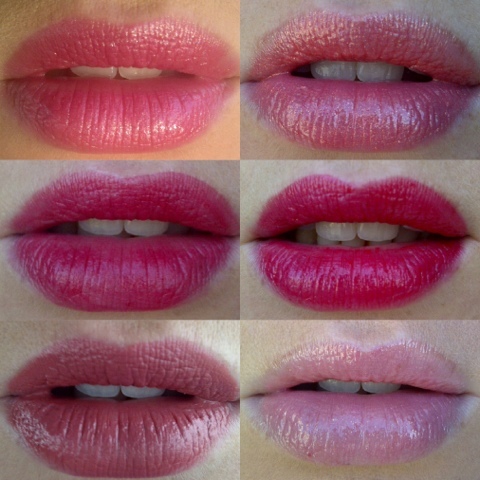 Finally, I tried the Per-fekt Lip Perfection Gel for the first time yesterday and I was so shocked at the result. I had expected this to be a kind of coloured, glossy lip balm-it has moisturising and priming properties but it is SO pigmented. I loved the colour which was a blue based red (great for making teeth look whiter) but I had to apply it with a brush so that I got a perfect application. It sinks into the lips like a balm and feels dry (not drying) on the lips so isn't like a gloss. It's a very unique formula that I haven't come across before. I also own Paramount which is a pale pink and far less pigmented. Tom Ford Emerald Lust-and a dupe!! 7/11 post-my current 7 beauty faves!